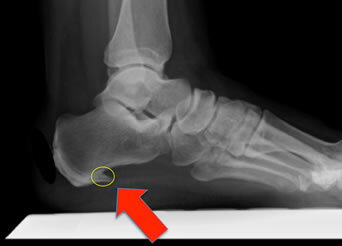 Plantar fasciitis is the most common cause of heel pain. The plantar fascia is the flat band of tissue (ligament) that connects your heel bone to your toes. It supports the arch of your foot. If you strain your plantar fascia, it gets weak, swollen, and irritated (inflamed). Then your heel or the bottom of your foot hurts when you stand or walk. Plantar fasciitis is common in middle-aged people. It also occurs in younger people who are on their feet a lot, like athletes or soldiers. It can happen in one foot or both feet.